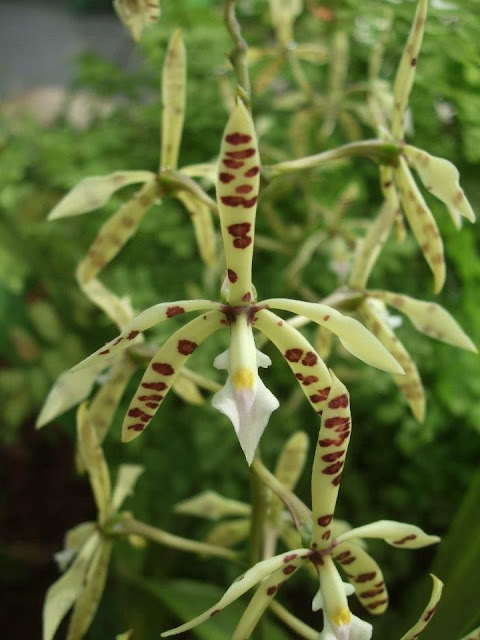 Encyclia prismatocarpa var lonoglossa is native to in Mexico and Central America in cloud forests as an ephiphyte on tree branches at altitudes of 1,200 to 2,500 meters. This orchid has pseudobulbs which each produces 2 to 3 leaves and produces bright, extremely fragrant flowers in the spring, summer and autumn that are quite long lived. Encyclia should be grown on tree-fern or cork slabs and humidity should ideally be kept consistently high. In areas that get hot and dry, it is best to raise Encyclia in pots as it is can be easier to maintain the plants moisture levels in pots than when mounted, in both cases regular misting is to be encouraged. It is a reasonably easy orchid for the beginner.